On the invitation of the Artsakh Democratic Party, President of the European Free Alliance in the European Parliament Francois Alfonsí and the EFA member Jordi Sebastia have been in Stepanakert. Today the EFA delegation started its visit from Artsakh State University where Member of the European Parliament, Jordi Sebastia delivered a lecture to the teaching staff and students. In his lecture on the topic of “How to highlight a normal life in conflict condition“ Jordi Sebastia gave the example of Nagorno-Karabakh, emphasizing that despite the problems of conflict, Artsakh does not present a conflict itself. So in the coverage of the topic emphasis should be primarily made on the peaceful life of acquired democratic values, valuable historical and cultural heritage and rich cuisine. The speaker proposed to develop a strategy for the information sector, which will present the benefits and achievements of Artsakh to the world, thus increasing interest towards the country. “The people of Artsakh won a free and sovereign existence and its right to democratic values can become an example for others,” said Jordi Sebastia. At the end of the meeting the participants were given an opportunity to address questions to the speaker. In the coming days, the delegation will meet with the representatives of Artsakh authorities and non-governmental organizations and participate in the celebrations of Artsakh Independence Day. 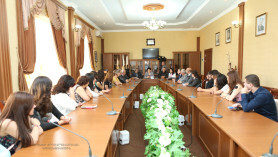 The Guests are accompanied by the director of the organization “European Friends of Armenia” Eduardo Lorenzo Ochoa.